In this Oct. 9, 2018, file photo, Offset and Cardi B are shown attending the 2018 American Music Awards at Microsoft Theater in Los Angeles, California. Cardi B on Tuesday said the pair has broken up. On Tuesday evening, the "Bodak Yellow" rapper took to Instagram with a big announcement for her fans: the pair is no longer together. 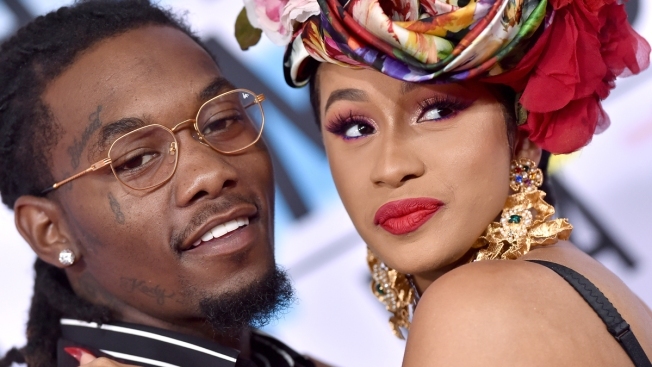 "So everybody been bugging me and everything and you know, I've been trying to work things out with my baby father for a hot minute now and we're really good friends and you know we're really good business partners," Cardi B said in the video. "He's always somebody that I run to to talk to and we got a lot of love for each other but things just haven't been working out between us for a long time and it's nobody's fault." "I guess we grew out of love, but we're not together anymore," she continued. "I don't know. It might take time to get a divorce and I'm gonna always have a lot of love for him because he is my daughter's father and yah." Cardi B captioned the post, "There you go...peace and love." Offset then wrote in a comment, "Y'all won." The Hollywood couple, who are parents to a daughter named Kulture, secretly got married in September 2017 with a frills-free ceremony. In fact, Cardi B didn't confirm the wedding until June of 2018. The breakup may come as a surprise to fans. After all, the pair attended 102.7 KIISFM's Jingle Ball concert last weekend at the Forum in Inglewood, Calif., where they had a PDA-filled performance.